I have a lot of jobs as a mom. I'm a driver, chef, house keeper, art teacher, homework tutor, piano teacher, and entertainer to name a few. One of my least favorite roles as a mom is being the babysitting scheduler. There are worse roles of course, but scheduling babysitters is one that I really hate. It makes me feel terrible because I can text 10 babysitters and get 9 rejections. I don't like needing help from people anyway, so when I do need help because I can't be in two places at once, it feels extra annoying to get rejected again and again. It also takes a lot of time that I would rather spend doing other things! We don't live that close to family, so my friends are my family. Often as friends we will swap kids and help each other with babysitting. Sometimes I just like to pay someone to babysit and not feel indebted to anyone once those two hours are done. 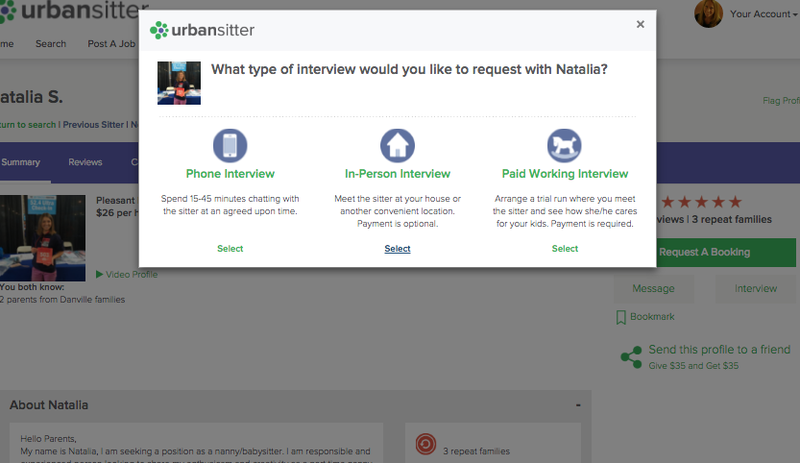 Finding a regular daytime sitter has been next to impossible over the past few years, which is why I was so excited to be introduced to UrbanSitter. 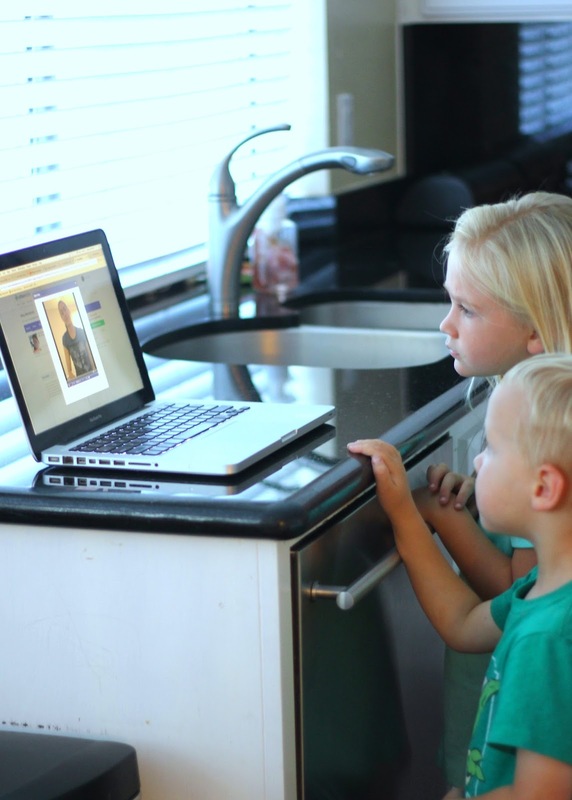 I've discovered that UrbanSitter is an efficient way to find trusted babysitters and nannies! 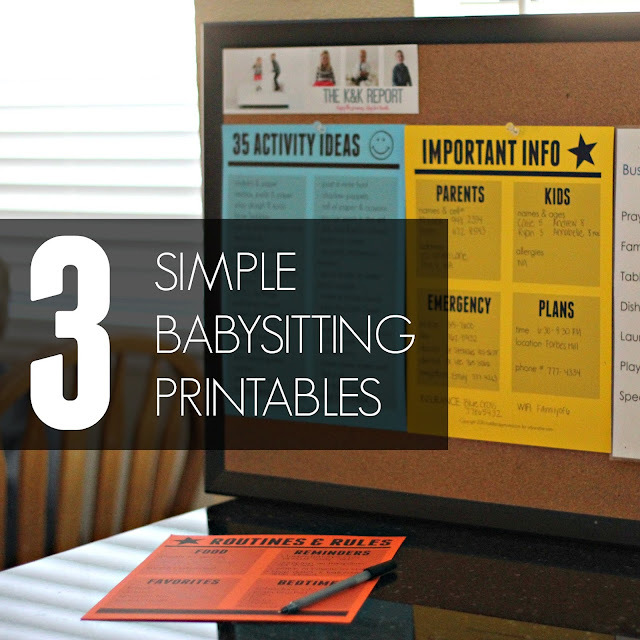 Today I'm excited to tell you about my experience with UrbanSitter and share some simple babysitting resources with you. 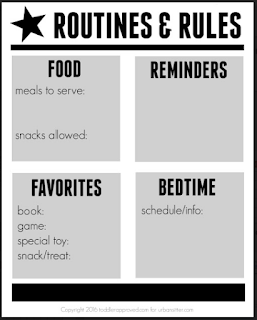 I'm including three FREE printables that I've created to make leaving your kids a little simpler. Hopefully you'll find them useful too. This post is sponsored by UrbanSitter! All opinions are mine. I have a hard time leaving my kids with a babysitter, but I also feel that it is important for my mental health to get out of the house without my kids. As I've gotten older and had more kids, I get a bit more anxious when I leave my kids with a sitter. Things can be a lot more crazy and overwhelming for a sitter when there are four kids versus one or two. As I've gotten more organized, I feel less stressed! 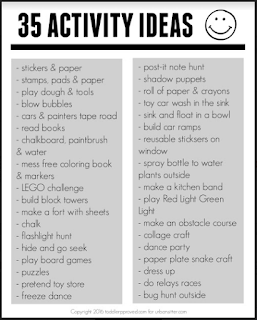 One thing that I always try to leave on hand with a sitter is a list of activities that my kids enjoy. I also show the babysitter where the craft cupboard, play dough, and favorite toys are located. 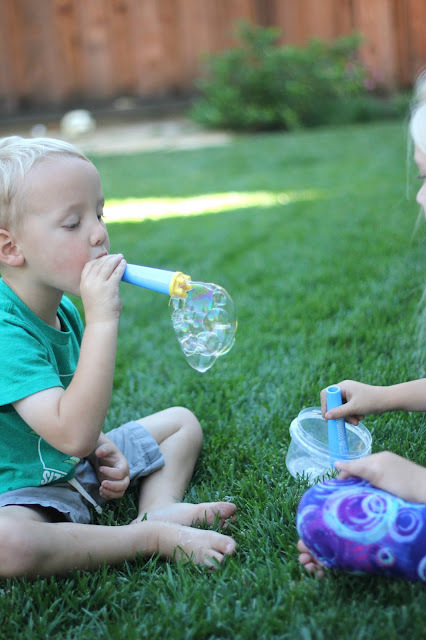 When the kids are occupied doing simple and fun activities, everyone is happier and the babysitter's job is easier. Although I am paying the babysitter and it is ok if her job isn't easy, my goal is for her to enjoy her time with my kids so that she wants to come back again! 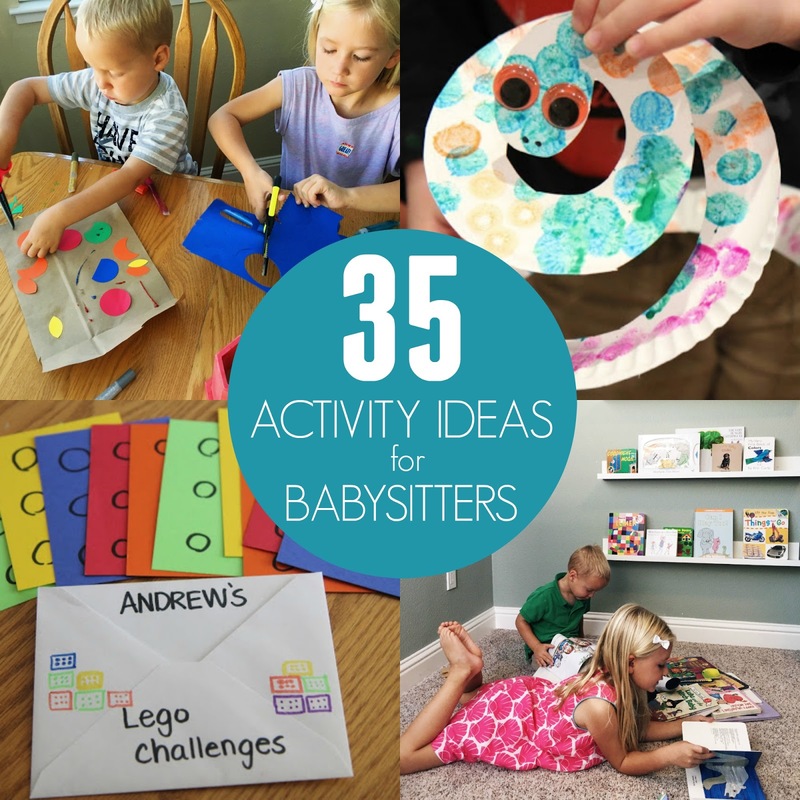 Recently I created a list of thirty five of our favorite activity ideas to do with babysitters. 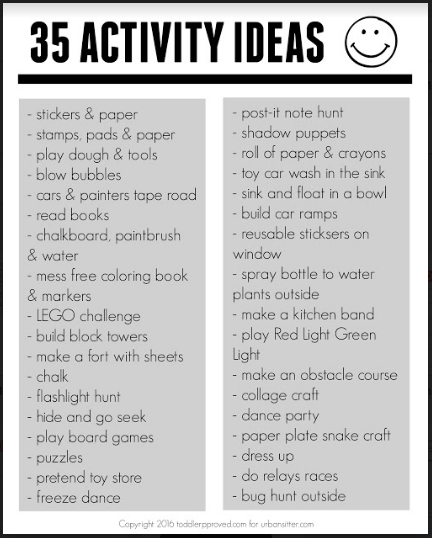 These activities are mostly mess free (other than a few of them), require only a few materials, and they are pretty open-ended. You can click on the free printable below to download your own copy of our activity list. 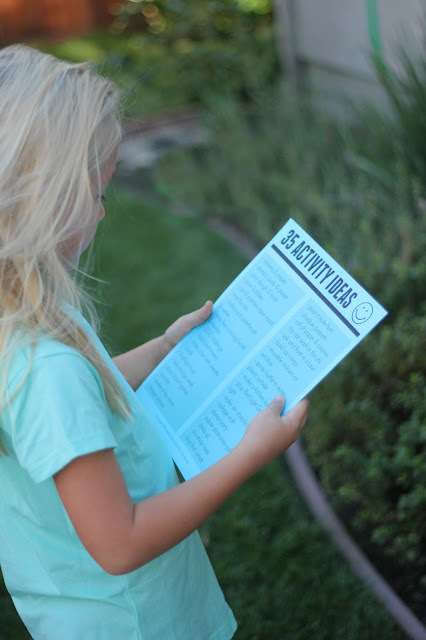 My kids love to scan it before a babysitter comes over so that they have all of their activity ideas (and materials) ready to go. One of my favorite things to leave out for babysitters is bubbles. Big pads of paper and stickers are also always a hit! 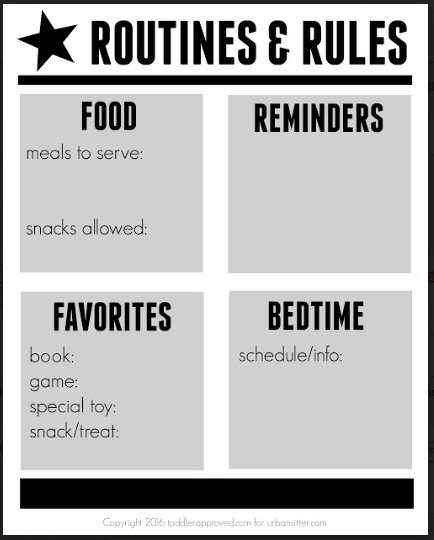 Do you have a favorite activity to leave out for babysitters? 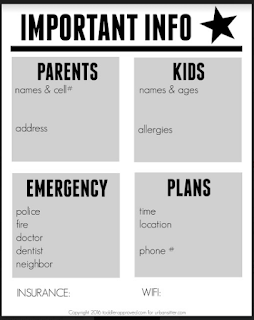 In addition to leaving out activity ideas, I keep important information about routines, rules, and emergencies posted in an easy to find spot. 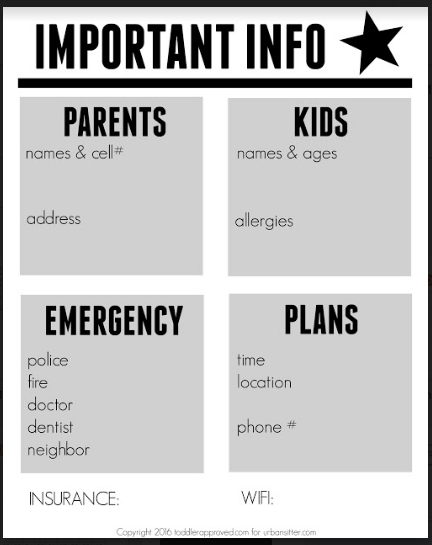 I am constantly looking for scrap pieces of paper to write down babysitting notes, so recently I typed up some babysitting forms that I could easily print off, write one, laminate, and keep in an accessible spot. Having these notes posted on the wall limits the amount of things I need to review with a babysitter before I leave. You can click on the links below to print out your own blank copies. As mentioned before, I have four kids. Two kids are in school for all or part of the day, and two kids are home with me most of the time. As a former elementary school teacher I always really appreciated the parents that would volunteer in my classroom, so I try and help out when I can at my kid's schools. Since I am unable to bring my littler kids with me to volunteer, it is sometimes necessary to find a babysitter. Although I have a great network of evening babysitters, finding people to babysit during the random times I need them during the week is hard. This is where UrbanSitter has been useful for me. To get started with UrbanSitter you need to create a free profile. Adding a photo to your profile before posting a job is a great idea since sitters are more likely to express interest in jobs where they can see a friendly face. Once your profile is set up you can start searching for sitters in your area! It is easy peasy! I really like UrbanSitter's search interface that helps match me up with sitters within my community. UrbanSitter also has a really simple and useful "Post a Job" section if you aren't having any luck just searching... or if you don't have time. Instead of searching and reaching out to specific sitters, you can write out your needs and sitters will reply with interest. You still remain completely in control of which sitters you then decide to book/interview, and there's no obligation to hire any of the sitters if they don't meet your standards. Once you've narrowed down your search you can request an interview with the babysitter you want to pick. 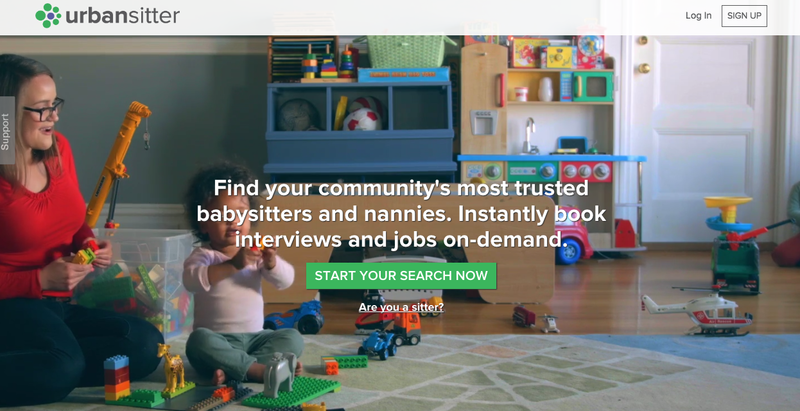 You can also watch video footage on the UrbanSitter site to get introduced to the babysitters you are considering. My kids loved this part! I like to do In-Person Interviews with my sitters ahead of time to explain job details/expectations and give them a tour of the house. This way they are prepared when they come to babysit the first time and my kids know who/what to expect. Last week we used "post a job" to find a sitter. After posting a job and getting a few interested replies, we selected our sitter. She confirmed the job promptly and on the day of the job she even sent us a text before she left her house to pass along her contact information and let us know that she was on her way! Our sitter was polite, punctual, asked good questions, and seemed very aware of the kid's developmental stages. She even caught a choking hazard that my 8 month old was trying to eat before I did. When I returned she gave me a simple overview of the afternoon and how the kids cooperated. 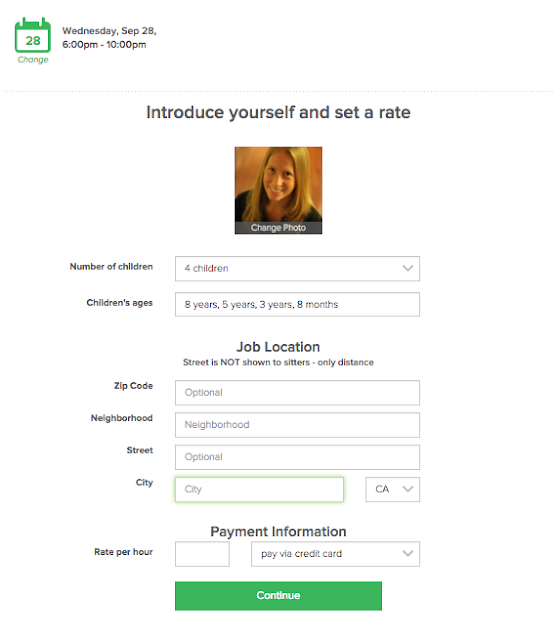 Then she helped me navigate the UrbanSitter babysitter payment process online. The kids had a phenomenal time and loved that she got down and actually played with them! They had LEGO creations to share with me and thought it was so cool that she jumped on the trampoline with them too (something I hate doing :)). The best part of the UrbanSitter process was that is was easy and people came to me instead of me having to hunt them down. I saved time and energy! As a busy mom that is really valuable to me. I could also pay online automatically, which saved me from having to do any last minute ATM runs. I also love that UrbanSitter connects with Facebook so that I can see babysitter recommendations from people within my social circle and community. 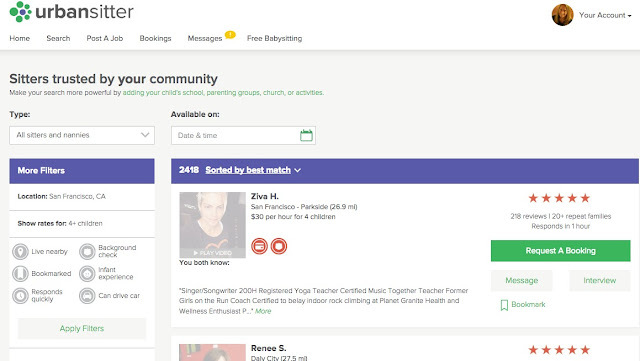 UrbanSitter also connect parents through their local parenting groups, kids' schools, soccer teams, churches and more. Sometimes the hassle of preparing for a babysitter and finding someone who is free is not worth it. In this case, the entire process for finding a babysitter was really simple. I found someone quickly, she was experienced and fun, and my kids had a great time while I was running errands. It was a win/win! It was so fun to partner with UrbanSitter this month! They are so awesome and are even offering a special promotion right now! Make sure you check it out! Try UrbanSitter now with a $50 credit for your first booking! Use promotion code MYFALL2016. Expires November 15, 2016. CLICK HERE TO GET STARTED. When was the last time you hired a babysitter? Follow UrbanSitter on their social channels for more important updates and promotions. They can be found on Facebook, Instagram, Pinterest, and Twitter. Disclosure: This post is sponsored by UrbanSitter. All opinions expressed in this post are mine. What a great service! I'll have to check this out. Thanks for the printables too! Oh supper this many activities are your giving.I will try it in a week days.